Based on an original Tele bridge-plate and is made from ‘Cold- Rolled Steel’. Our Bridge plates are artificially aged by a special procedur which changes the internal crystaline structure of the metal itself, which we then call “Internally aged”. During the manufacturing process, tension is produced in the metal especially around the edges. At first, like most people, I didn’t pay any attention to this until one day I discovered something very interesting about a manufacturing technique used in the making of church bells(! ): to prevent cracks from appearing and to help increase the vibration qualities (i.e. sustain), newly cast bells are very slowly cooled down and then afterwards heated up again to a certain temperature and again allowed to very slowly cool down. This process can be repeated several times and ‘relaxes’ the metal. Out of pure curiosity I decided to try out this technique on a Tele bridge-plate. Using a gas-burner I heated the bridge-plate up to a very high temperature and then let it slowly cool down. I then hung it up with cotton thread next to an identical but untreated bridge-plate and tapped them both using a small beater and was completely surprised and astonished with the result: the heat treated bridge-plate rang noticably longer than the untreated version! The only disadvantage was that the chrome surface of the treated bridge-plate was completely burnt black, ruined in fact! So, do NOT try this at home! 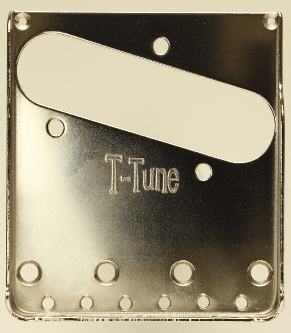 The T-Tune bridge-plate is nickel-plated after the heating process so that the results of the heating/burning cannot be seen! When installed on a guitar the treated bridge-plate gives much more sustain and ‘twang’. The guitar is also louder and the tone clearer (not piercing or sharp!). The basic tone character remains, as the same material as a standard bridge-plate is used. Using for example, Stainless-steel or any other material would change the basic tonal quality! The feedback potential can also be increased so we recommend that High-Gain players use the version with the two extra fitting-screws which ‘control’ the bridge-plate and also increases the transfer of the string vibrations to the body. For Clean players or those that do not want to drill any extra holes in their guitar we offer the ‘standard’ version without these extra screw holes.